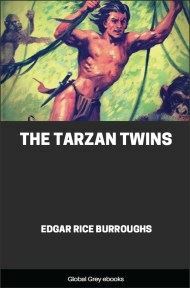 The third in the series of books about the title character Tarzan. 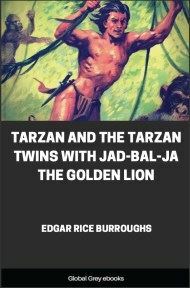 Not long after Tarzan claims his hereditary title of Lord Greystoke and marries Jane, their infant son, Jack, is kidnapped in London by his old Russian enemies, Nikolas Rokoff and Alexis Paulvitch. 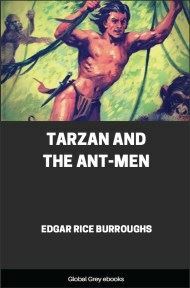 Following an anonymous call about the whereabouts of Jack, Tarzan himself falls into Rokoff's trap and is imprisoned aboard a ship. "The entire affair is shrouded in mystery," said D'Arnot. "I have it on the best of authority that neither the police nor the special agents of the general staff have the faintest conception of how it was accomplished. All they know, all that anyone knows, is that Nikolas Rokoff has escaped." John Clayton, Lord Greystoke—he who had been "Tarzan of the Apes"—sat in silence in the apartments of his friend, Lieutenant Paul D'Arnot, in Paris, gazing meditatively at the toe of his immaculate boot. His mind revolved many memories, recalled by the escape of his arch-enemy from the French military prison to which he had been sentenced for life upon the testimony of the ape-man. He thought of the lengths to which Rokoff had once gone to compass his death, and he realized that what the man had already done would doubtless be as nothing by comparison with what he would wish and plot to do now that he was again free. 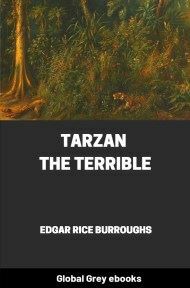 Tarzan had recently brought his wife and infant son to London to escape the discomforts and dangers of the rainy season upon their vast estate in Uziri—the land of the savage Waziri warriors whose broad African domains the ape-man had once ruled. He had run across the Channel for a brief visit with his old friend, but the news of the Russian's escape had already cast a shadow upon his outing, so that though he had but just arrived he was already contemplating an immediate return to London. "It is not that I fear for myself, Paul," he said at last. "Many times in the past have I thwarted Rokoff's designs upon my life; but now there are others to consider. Unless I misjudge the man, he would more quickly strike at me through my wife or son than directly at me, for he doubtless realizes that in no other way could he inflict greater anguish upon me. I must go back to them at once, and remain with them until Rokoff is recaptured—or dead." As these two talked in Paris, two other men were talking together in a little cottage upon the outskirts of London. Both were dark, sinister-looking men. One was bearded, but the other, whose face wore the pallor of long confinement within doors, had but a few days' growth of black beard upon his face. It was he who was speaking. "You must needs shave off that beard of yours, Alexis," he said to his companion. "With it he would recognize you on the instant. We must separate here in the hour, and when we meet again upon the deck of the Kincaid, let us hope that we shall have with us two honoured guests who little anticipate the pleasant voyage we have planned for them. "In two hours I should be upon my way to Dover with one of them, and by tomorrow night, if you follow my instructions carefully, you should arrive with the other, provided, of course, that he returns to London as quickly as I presume he will. "There should be both profit and pleasure as well as other good things to reward our efforts, my dear Alexis. Thanks to the stupidity of the French, they have gone to such lengths to conceal the fact of my escape for these many days that I have had ample opportunity to work out every detail of our little adventure so carefully that there is little chance of the slightest hitch occurring to mar our prospects. And now good-bye, and good luck!" Three hours later a messenger mounted the steps to the apartment of Lieutenant D'Arnot. "A telegram for Lord Greystoke," he said to the servant who answered his summons. "Is he here?" 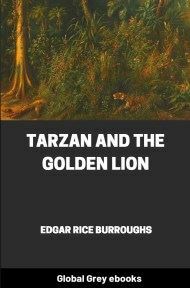 The man answered in the affirmative, and, signing for the message, carried it within to Tarzan, who was already preparing to depart for London. 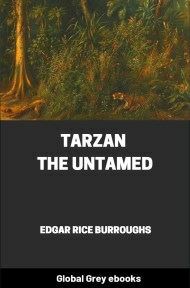 Tarzan tore open the envelope, and as he read his face went white. "Read it, Paul," he said, handing the slip of paper to D'Arnot. "It has come already." "Jack stolen from the garden through complicity of new servant. Come at once.—JANE." 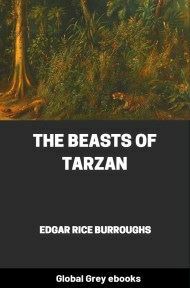 As Tarzan leaped from the roadster that had met him at the station and ran up the steps to his London town house he was met at the door by a dry-eyed but almost frantic woman. Quickly Jane Porter Clayton narrated all that she had been able to learn of the theft of the boy. The baby's nurse had been wheeling him in the sunshine on the walk before the house when a closed taxicab drew up at the corner of the street. The woman had paid but passing attention to the vehicle, merely noting that it discharged no passenger, but stood at the kerb with the motor running as though waiting for a fare from the residence before which it had stopped. Almost immediately the new houseman, Carl, had come running from the Greystoke house, saying that the girl's mistress wished to speak with her for a moment, and that she was to leave little Jack in his care until she returned. The woman said that she entertained not the slightest suspicion of the man's motives until she had reached the doorway of the house, when it occurred to her to warn him not to turn the carriage so as to permit the sun to shine in the baby's eyes.